Our Magnesium Oil comes directly from the Dead Sea, the most Ancient health retreat on Earth. The charged Ionic solution is absorbed topically. 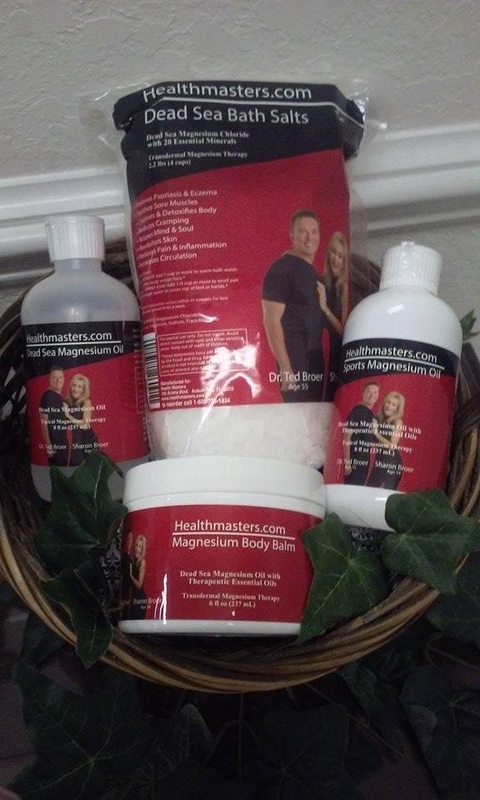 This kit is part of our new topical magnesium protocol. Magnesium Body Balm - 4oz Magnesium Oil based balm has been infused with Arnica, Aloe Vera, Jojoba & Lavender Oils to soften, heal & rejuvenate your body. It contains the unique blend of essential Dead Sea minerals that makes these magnesium products so exceptional. Designed for daily use, Body Balm has been known to clear acne breakouts, heal rashes, hydrate dry skin, diminish wrinkles and relieve psoriasis & eczema. Sports Magnesium Oil - 8oz. A positively-charged, ionic, mineral solution has a mild, refreshing scent of vanilla & spearmint to lift the spirit and revitalize the senses. Designed for athletes and active adults, this supercharged sports oil works synergistically with the human body to increase energy levels and optimize muscle function for peak performance. Before, during or after strenuous activities, Sports oil can boost endurance, reduce fatigue and cramping & speed muscle recovery. Dead Sea Magnesium Oil- 8oz. Supports optimal heart health, heals & soothes skin, detoxifies organs, aids peak muscle performance, balances calcium for strong bones & joints, relieves pain & stress and nourishes & energizes cells. Dead Sea Bath Salts - 2.2lbs Unrefined, unprocessed & undiluted, our Bath Salts bring the healing powers of the Dead Sea into your home. People have travelled from afar for thousands of years to soak in the curative mineral water at the most Ancient health retreat on Earth. From heart disorders to muscle & nerve pain to skin ailments, soak it all away with our all-natural, therapeutic soak. This positively-charged, ionic mineral soak is readily absorbed by your skin — the human body’s largest organ — for immediate relief, rejuvenation and relaxation. Transdermal, or topical, magnesium application is the most effective method to supplement the body's magnesium levels. These levels need to be replenished daily. Magnesium Oil is recommended by doctors, physical & massage therapists, naturopathic healers and many other health professionals for treatment of a wide variety of ailments.